SMI’s partnership with our host communities has come a long way. 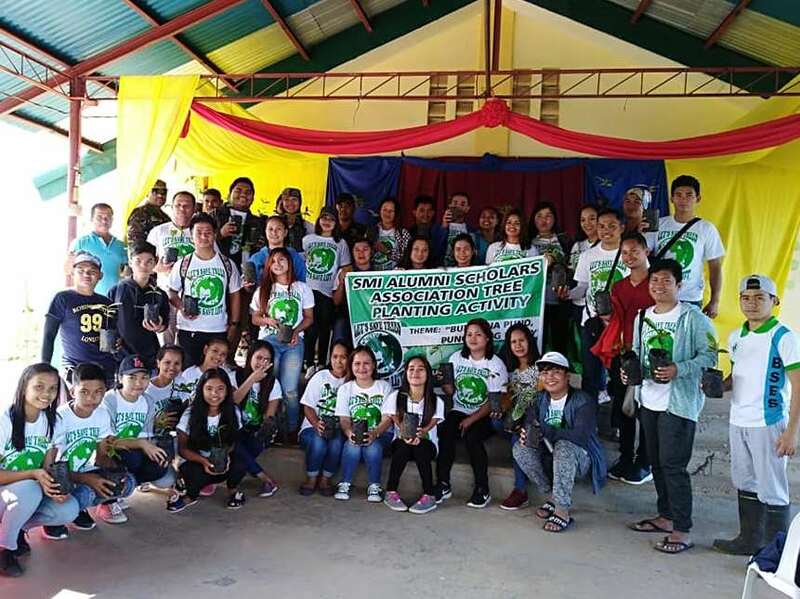 As a responsible partner in community development, SMI has invested PhP1.2 billion to support the development initiatives of the local government units, tribal communities, and other partners in the public and private sectors. These programs have transformed into beautiful stories over the years - real stories of real people who have experienced real change in their lives. More of these inspiring stories will be featured in the maiden issue of Panag-uban, the annual community development magazine published by SMI, that is soon to be released this August. When I learned about the free TESDA-accredited skills training in Tampakan, I decided to enroll in Shielded Metal Arc Welding (SMAW) NC II program because I believed that I can do it. While I was studying, I had to take care of my two children, even bringing them to school. It was really a challenge for me, but I was able to survive and complete my training. Since I obtained a TESDA Certificate (NC II) as a welder, I found it easier to get employed. As a result, my financial status improved and I am now able to provide for the needs of my family. Being a welder is not easy for a woman like me, but I persevered and am now happy with what I’m doing. Recently, I completed a training on Construction Occupational Safety and Health (COSH) and got promoted as a Safety Officer in our company. The line of work that I chose helped improved my perspective in life. I realized that we should not be limited by gender stereotype. We should put our hearts into what we do and take advantage of every opportunity that comes our way. My experience is proof that women can excel in a man’s world. Indeed, the skills training program of LGU Tampakan, supported by SMI and TESDA, is a blessing to me and the residents of Tampakan. I hope that other women and mothers in Tampakan will be inspired by my story and take advantage of this program. 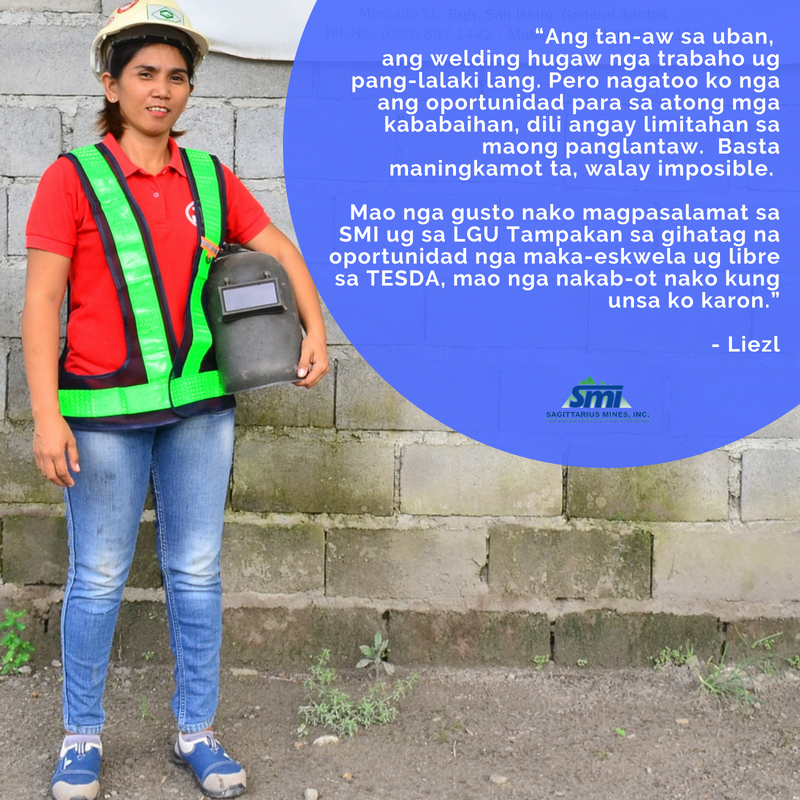 When I learned about the free TESDA-accredited skills training in Tampakan, I decided to enroll in Shielded Metal Arc Welding (SMAW) NC II program because I believed that I can do it. While I was studying, I had to take care of my two children, even bringing them to school. It was really a challenge for me, but I was able to survive and complete my training. Indeed, the skills training program of LGU Tampakan, supported by SMI and TESDA, is a blessing to me and the residents of Tampakan. I hope that other women and mothers in Tampakan will be inspired by my story and take advantage of this program. Liezl Bagtasos- Fernando has since been working in the construction sector, having been involved in the building of the Tampakan Public Market in 2012 and other projects in the cities of Koronadal, General Santos and Davao. She currently works in a construction company in General Santos City as Safety Officer.